The private social network Path, originally launched on iOS and now also available on Android, is set to hit 3 million users this week, says founder Dave Morin. The statement was reported by Emily Chang of Bloomberg TV, from the network’s News Maker Lunch event. The network last reported that it had over 2M users in April, 2012, when it announced a $40M funding round from Redpoint Ventures and others, at a $250M valuation. The newest exact number we see is February 3rd, when Path hit 2M users. 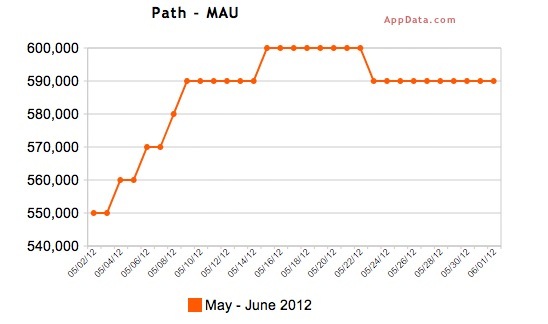 That means that Path has had 50% growth over the last 119 days, signing up around 8,400 users a day. 3M users for a mobile-only social network isn’t anything to scoff at. It’s also not enormous, as Instagram — the photo-based network recently acquired by Facebook — has some 57M users. The metrics company AppData reports that Path sported some 140K daily active users and some 590K monthly active users in the last 30-day period, but those numbers are purely Facebook integration values, and don’t represent the number of users which utilize the Facebook connect feature of the app to find people to follow. Path got a nice bump from its relaunch in November of last year, jumping from 30K users a month using Facebook Connect to some 250K users, an 800% boost. Path was involved in the privacy kerfuffle early this year over iOS apps downloading and storing user contact data and other information. The network responded openly to the issues and corrected the way they were handling it quickly, which likely helped to mitigate any ill will towards it. Either way, it doesn’t seem to have stunted its growth much. Instagram and Path stand out as interesting examples as they’re both of a modern breed of startup that is mobile first and, so far, mobile only. Instagram’s sale was almost completely thanks to its success on Apple’s iOS platform, with the Android launch coming just weeks before the acquisition.